Dear old Dad. Provider, hard workers, and deal lover. Celebrate Dad this year with great deals from these retailers. Make sure you check before you go as supplies can be limited. Happy Father’s Day to each and every Dad. *Offer available while supplies last. Other exclusions apply. Coupon 1 valid 7/2/18-8/5/18. Coupon 2 valid from 8/6/18-9/2/18. SEE FULL TERMS AND CONDITIONS. Purchase $125 in gift cards for Dad & get a voucher for a 30-minute FREE Total Body Stretch session. Dad is free with the purchase of one full-priced adult. Father’s Day package upgrade available for additional $25 (plus tax) during checkout or at the door. Package includes framed photo of Dad and family, medieval cork coaster set, 25 oz glass stein with choice of beer or soda (non-alcoholic beverage will be served to minors). Dads get the first 6 ounces of frozen yogurt free in a small cup or cone. Offer valid only on Sunday, June 17. Offer may vary by location. Dad will receive a free Old-Fashioned Sundae all day on Father’s Day, Sunday, June 17. To redeem the offer, fathers of all ages should show proof of their “dad-ship” by bringing in their children, showing a family photo or telling a story about their kids. 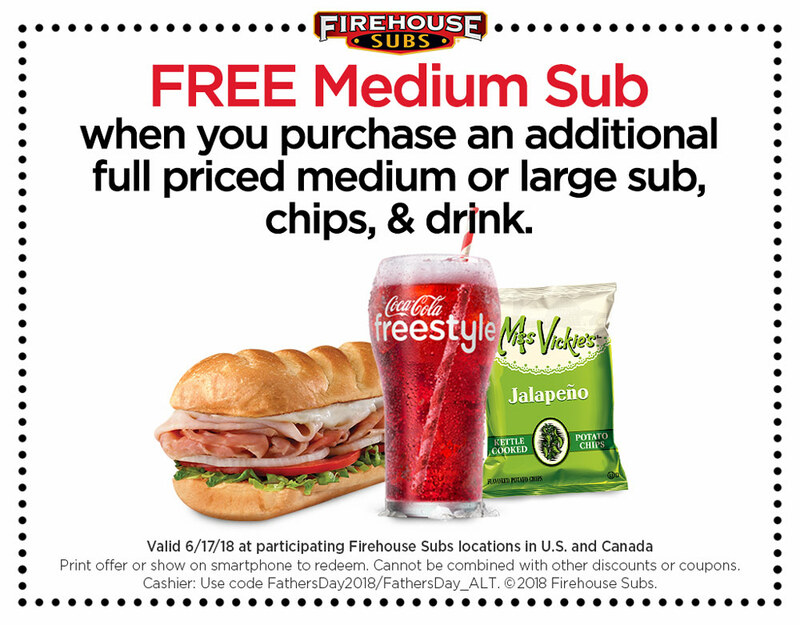 Fathers get a free medium sub when you purchase a full-priced medium or large sub, chips and a drink. The offer is only valid on Father’s Day, June 17. Celebrate Father’s Day all month long. Participating Applebee’s locations offer $1 Long Island Iced Tea drinks for the month of June.